Part 2, "Why Strip Strike"
In the last newsletter, I covered how to strip in line, and how to strip strike. I left you with the questions, "Why do you keep your rod pointed at the line? Why don't you raise the rod tip? Why strip strike?" Many of us start fly fishing, me included, on trout streams. We are fishing size 14 or smaller flies. We are fishing tippet that will break at 2-4 pounds, and we are fishing for fish that are delicately rising to dry flies. That is why we are told to raise the rod tip to set the hook. When you raise the rod tip to set the hook, you protect the tippet by the flex in the rod. A small hook easily slides into a delicate trout's jaw. There is nothing delicate about fishing for red fish or fishing in salt water in general. When you get a strike, you need to drive a large fly deeply into a tough jaw. You keep your rod pointed directly at the line so you can do just that. If your rod is pointed at an angle to the line, and you get a strike, and set the hook with a strip strike, your rod tip will absorb the energy of the strike. The same thing happens if you move the rod to the side or raise it. The tip of the rod absorbs the energy of the strike. Combine that with the stretch of the line and leader, and you will barely pierce the fish's jaw. Strip striking, with the rod pointed directly at the line, is the only way to move the fly far and fast enough to drive the hook into the fish's jaw. You do not want the rod to absorb any of the energy when you set the hook. Your line and leader have stretch in them, and that already absorbs energy. In my opinion, the only real reason to strip strike is because it is the only way you can impart enough energy to the fly to drive it into the fish's jaw or lip. Maybe I am wrong, but it doesn't really matter why. All that matters is that you get the hook set, and a strip strike is the best way to do it. Last night a friend, Craig Stalnaker, and I went out for the last hour of daylight looking for tailing red fish in the grass. We saw three fish, but they weren't tailing hard. Two of them were just cruising and the other barely had his tail out of the water. 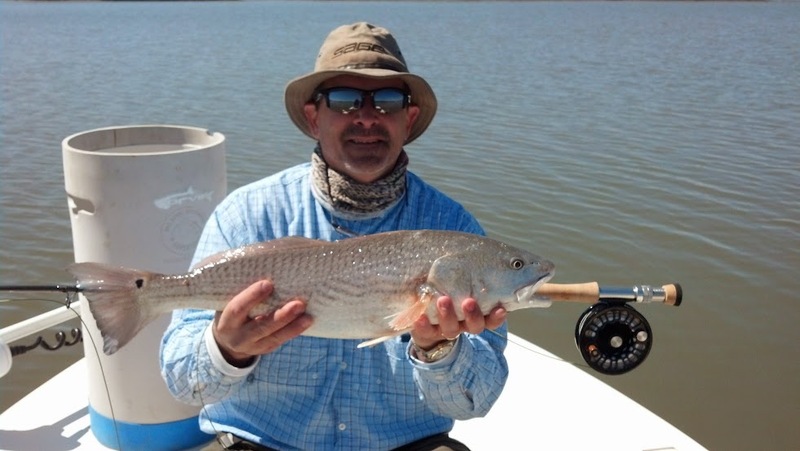 This is the start of the season for chasing Red Fish in the grass. 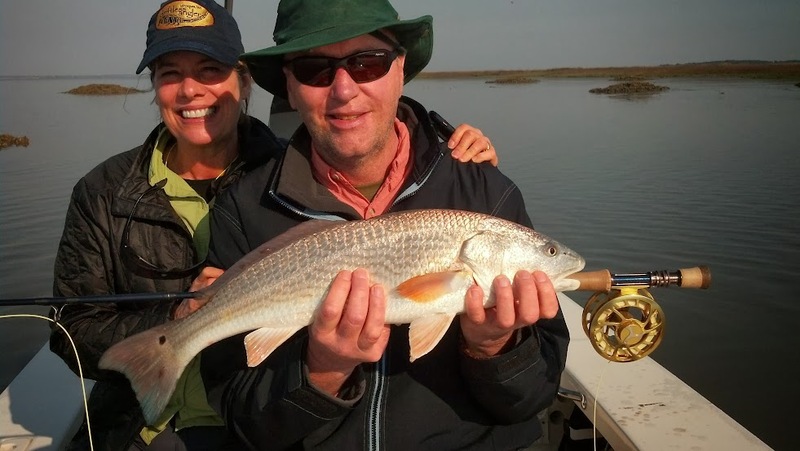 There is no more exciting way to fish for reds with a fly rod than in the grass. Below are dates when we will have tides high enough for "tailers." Call soon as these dates book early. I am already booked for the first week in October. October: 6-11 (morning tides, one of the best weeks of the year) This week is booked. These are tide PREDICTIONS. I have tried to be very conservative and publish only those predictions where there is a near 100% chance the marshes will flood while there is daylight. There will be other days where we have a strong east wind, and the marshes will flood. There will be days where we have a west wind, and the marshes will not flood. Most likely, there will be days on either side of these dates where we can fish in the grass. Just remember, in fishing, there are no promises. The Triple Tail are in front of Jekyll right now. 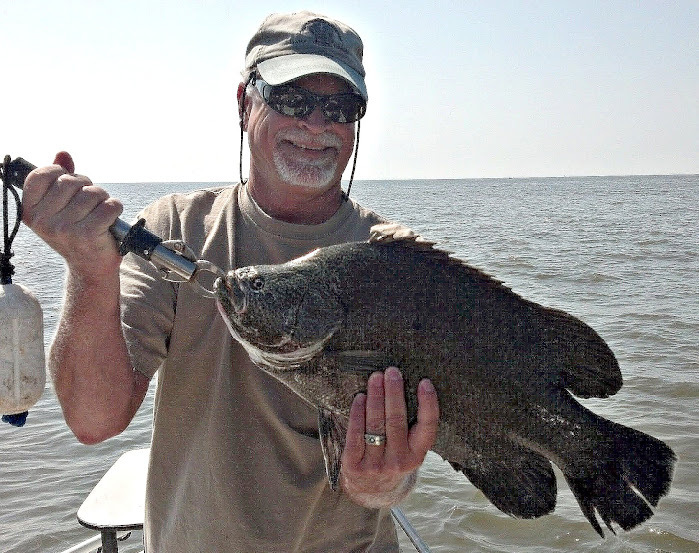 This is a very unique fishery where the Triple Tail free float from a few hundred yards off the beach to over five miles offshore. There are several theories why they are free floating. Some say they are doing it to imitate flotsam to attract bait fish, but the generally accepted reason is that they are spawning. Regardless why they are there, they offer a great sight fishing opportunity. At this time of year, I typically try to schedule the trip around a low or high tide red fish trip and spend a few hours in the middle of the day looking for Triple Tail. We fish for them by idling around looking for the fish, which look like floating trash bags. When we see them, I use the trolling motor to get within fly casting distance. If you can get the fly in front of them, many times they will grab it and be off to the races. The typical fish is from two to four pounds, but there are fish out there up to 20+ pounds. It is a great opportunity to give your casting skills a test and fish for a very unique fish in a very unusual way. We recently had flooding rains, and that has pushed in a lot of fresh water and muddied our water. However, the water is clearing and should be back to normal by the first full week in May. 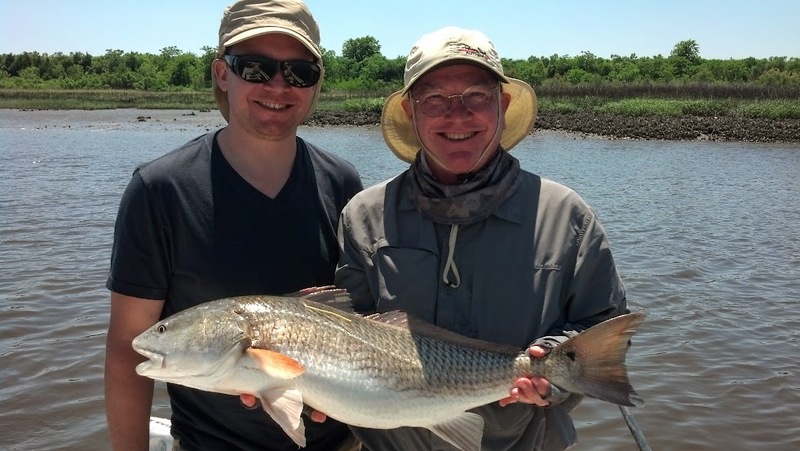 If you find yourself coming to the Golden Isles of Georgia this Spring or Summer, be sure to give me a call and let's go, "Hunting Fish in the Marshes of Glynn." 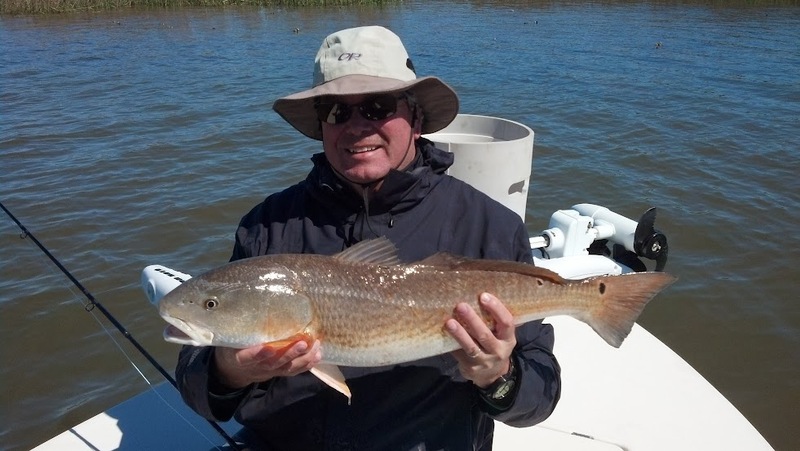 If you come to St. Simons, be sure to visit St. Simons Outfitters. Ellen has vastly expanded the fly tying area. She is fully stocked for summer with Columbia, Patagonia, Marmot and Orvis brand merchandise. She is also expanding the line of local fly patterns and will soon begin carrying some innovative patterns from Chris Webber of Brack n' Brine products. If you are going to fly fish in St. Simons, go by St. Simons Outfitters, pick up a few of these flies and catch some fish.